I thought this book was really good too – it gave me a lot to think about. I have to admit that I was a little wary of Skloot’s motivation at first. It definitely deserves a place on the wishlist! I loved this one! I am impressed that you were able to listen to it because, like you said, you can’t go back and re-read if a section didn’t make sense. My problem is I tend to zone out everyonce in awhile (both with print and audio) and then I’ll have to go back. I am glad listening to it didn’t cause problems. I think listening to the audio kept me from getting too caught up on any one little thing, I found that even if something was a little confusing, it usually cleared up if I kept going. I’ve been wanting the read this one. I will definitely go for the audio version. It sounds great! Great review. We had similar thoughts on this one. I can’t believe that I hadn’t ordered this one on audio yet…so that is exactly what I just did. It has been on my “want” list since it was featured in Bookmarks a few months ago. Yep, some of Skloot’s methods had me uncomfortable too. This one I read in print — I wanted to see the photos! I’m glad this is good on audio! I think it’s nice they switched narrators of Deborah, since she’s a huge character in the book too. I’m so glad to read your review. I’ve been trying to make some decisions on how I was going to get through all of the books I want to read and which ones I could go with audio on. I wasn’t sure this would work but now I’ll head to the library to pick it up. I finally made the trek to my computer. Bahni Turpin is one of my favorite narrators! I still don’t know if I want to read this because of the way Skloot harassed the Lacks family but I’m more willing to at least try the audio after knowing that Turpin is narrating. Cassandra Campbell is my favorite narrator, if I see her name on the book I will read it. She is wonderful! I have this audiobook in my TBR pile because of reviews like this one. I’m really looking forward to it. Thanks for this. 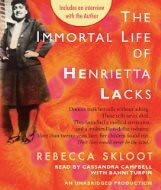 I recall seeing a documentary a month or so ago about the Henrietta Lacks story. If I’m correct, it was prior to the release of the book. Then I recently saw the book in Barnes & Noble; and made a note to read it. I saw this post the other day but didn’t get around to commenting on it. I’m trying to decide whether I want the print or audio version. I’m leaning toward audio after reading this post.